The unnamed sources may be right about one thing: it may be true that everyone was doing it, or at least something similar for the same purpose. One source said, “If Valukas went into Goldman Sachs, what do you think the report would look like? This would be a fairly tale compared to that.” In other words, Lehman simply had the misfortune to not be bailed out by the U.S. government, leaving its finances open for all the world to see. The Lehman report could be interpreted two ways. One is that Lehman was a case of bad apples. If you had asked me before about fraud and the financial crisis, I would have said that there was probably some fraud around the edges, but it was unnecessary–the crisis could have been produced by entirely legal behavior, and probably was. But exposure of accounting fraud (or near-fraud) at Lehman could have the unfortunate effect of causing people to focus on fraud as an explanation of the crisis, implicitly letting all the other banks (and regulators) off the hook. The other interpretation is that if Lehman was doing it, then probably everyone was, or at least a lot of people were. Maybe Goldman didn’t need to because it was shorting the housing market, but any other bank that was about to get blown up by its own toxic assets would have a strong incentive to push the limits of legal accounting as far as it could to buy itself a little more time. The implication of Abelson’s sources is that the latter interpretation is correct. This entry was posted in Commentary and tagged financial crisis, Lehman. Bookmark the permalink. Well sure, but what’s your annual income, James? Seriously, though… I know most people do not think violence solves anything, but admit it: This sort of thing makes you reconsider. One is that Lehman was a case of bad apples. When it’s legal to sell bad apples, it’s unprofitable to sell good ones. Lack of enforcement is practically equivalent to lack of regulation. I thought the following was worth re-posting. I could be wrong, after all, I’m just another Yapper, who has seen 75% of his co-workers loose their jobs. Live in hope, never die in despair. STEWART:” It’s taken you idiots two years during the worst financial collapse since the Great Depression to compile a list of regulations we should have put into place the next day? Well, better late than never, I guess. At least now we can have some legislation that’ll stop the next crisis from occurring. DODD: [Video] This legislation will not stop the next crisis from coming. Negative since I started law school. (OK, I know that technically personal income can’t be negative, but you know what I mean.) Luckily I am married to someone with a job. It occurs to me that had Lehman Brothers bought up another company, then found that that company had used such “borderline-legal transactions to massage your balance sheet at the end of the quarter” that is considered normal, they would have been screaming bloody murder and bringing lawsuits against the perpetrators of such transactions. But what do I know, I’m just a know nothing yapper. “Let’s make sure this video goes viral for as long as it takes to replace the taste of corporate pablum with easily identifiable reality – because we still have far too many people in this country who, even now, willingly allow themselves to led by the nose by corrupt corporations. Without any doubt, citizens will continue to be targeted, and subsequently used as tools until they clearly understand ‘the game’. This video can provide clarity for many. Really? There was so much widespread bottom-level fraud in the mortgage and housing markets during the bubble that it would have been pretty surprising to me if there was not much top-level fraud at the management and accounting levels of the Wall Street financial firms. In fact, I’ve always been suspicious of reports from the Fed and other regulators that seem to turn a blind eye to fraud; it seems like very much a big part of the story. watching heads roll on Wall Street — literally! There is no value created here, by Goldman Sachs et al. They are ugly, greedy folk — and if those of you who think govt watch dogs are going to be noble souls if they were in charge, look again! Gaming “the system” is not building wealth, bettering the lives of folk. Post’s conclusion has the ring of truth. I wonder if these banker comments have been taken out of context a bit. Lehman must have lost enormous sums of money, something north of $150 billion, and yet two weeks before it went down their accountants claimed everything was just fine. These repo-105 transactions were misleading, they were “only” manipulating leverage ratios, and not profit/loss statements. There are likely much greater crimes here. Oh ya Davy boy!!! It’s really really really useful!!! And really really really streamline!!! I think I just got tingles thinking of all the streamline benefits we’ve gotten from 144a!!! And if you failed to get tingles also, you’re not “sophisticated” like all the buyers Mr. Merkel knows. No, he’s right. Getting rid of 144a would help lawyers stay busy writing up documentation, but would accomplish little else. You have strange fixations. Are you at all familiar with the number of transactions rely on 144A? You asked Mr. Merkel for examples, but I’m not sure how he could do that. Every day there are deals done relying on what is not a very controversial rule. Without the rule, there would be additional substantial expense to do registrations. What more evidence of streamlining do you need? All you can manage is a “wiki” reference and still ZERO examples of how 144a has improved the way America does business??? I guess you got me. How can I argue with a mountain of evidence like that??? Touche. You have really got me. Going right after the jugular by undermining my heartfelt citation to wiki is a rhetorical coupe de gras. The rule makes certain transactions between QIBs faster and cheaper. That’s two examples. It is also what I said above, and what Merkel said before, and what greenback just said. That’s two more examples than you have for why it is bad. But, frankly, you really sound like you have no idea what the rule is or does. I know exactly what 144a does, and it’s sole function: To protect traders and dealers from liability and criminality after they screwed over investors. I didn’t need to toggle back and forth to “wiki” AJ style to give that answer either. Trinity:” I know why you’re here, Neo. I know what you’ve been doing… why you hardly sleep, why you live alone, and why night after night, you sit by your computer. You’re looking for him. I know because I was once looking for the same thing. And when he found me, he told me I wasn’t really looking for him. I was looking for an answer. It’s the question that drives us, Neo. It’s the question that brought you here. You know the question, just as I did. Trinity: The answer is out there, Neo, and it’s looking for you, and it will find you if you want it to…. Morpheus: This is your last chance. After this, there is no turning back. You take the blue pill – the story ends, you wake up in your bed and believe whatever you want to believe. Ted – Thanks for confirming my supsicions. To paraphrase, coporations have no soul to condemn or body to imprison. Convenient. WASHINGTON (AP) “The head of the Securities and Exchange Commission confirmed Wednesday the agency is investigating several companies’ actions in the run-up to the financial crisis of 2008. SEC Chairman Mary Schapiro said “it would be safe to assume” that the agency is looking very closely at the conduct of a number of firms during this time. She did not name the companies. Lawmakers want to know if the sort of accounting gimmick recently uncovered that was used by the collapsed investment firm Lehman Brothers to mask billions in debt was widely deployed on Wall Street. I think this crisis is in some way a modern version of Gresham’s law. Credit instruments that are improperly priced, that is the risk is not reflected in the price will force credit that is properly priced ouit of the market. It wouldn’t work that way in a perfectly transparent market but the lack of transparency in American credit markets seems to have become much worse in the last few decades. When you look at how Phil Gramm and other Republicans tried to kill the SEC slowly with bad appointments and starvation of funding, the SEC actually doesn’t deserve a lot of the criticism it has received. Yes they F*^ked up and dropped the ball many times, but it was mostly from external factors of Congress trying to squash them. There have been some small (I said SMALL) glimmers of hope in some NYT stories and I especially like the fact Rick Bookstaber is there now. A small squadron of Rick Bookstaber type guys is worth 5 armies of Christopher Coxes. Good point about the low-level fraud. The fraud trickled up, or was pushed down, or a combination of the two. Everyone DID have a strong incentive to push the limits of legal accounting, in fact the whole house of cards was built on pushing the limits of legal accounting. This crisis became so destabilizing precisely because the risks were hidden (legally). The SIVs and the bank affiliated ‘shadow banks’ where much of the toxic crap was hidden, were more sophisticated versions of ‘legal’ 105 Repos except on a massive scale. And like the 105, this crap came right back to the banks, and we got stuck with the bill. Lehman hid 50b with the 105, the SIVs hid about 400b. Are you revolted by these’former Lehman executives’ statements? If so, good, remember that revulsion the next time those delicate phrases ‘regulatory arbitrage’, ‘captured regulator’ comes up. These ‘former execs’ guys have done us a favor by personalizing the crisis and attaching a voice to the the basic fact. They WERE all doing ‘it’. legally. The issue is in fact relatively easy to understand. There was a really excellent term for it on one of the academic papers I read, but I forgot it, but the term defines the counterparties to your counterparty. Kind of like “3rd-person counterparty” (my retarded lingo, not anything I read). Firm A and Firm B do a deal. Firm B and Firm C do a deal. But Firm A doesn’t know how much leverage Firm C has, and if Firm C gets F’ed up then Firm B gets F’ed up. Then it goes back to A. Firm A thought the deal with B looked sound, because they didn’t know B was dealing with C and C was F’ed up. This is what happens when you have no registered exchanges for derivatives (transparency). And I can almost guarantee you 98% if they don’t get all derivatives (CDS) on registered exchanges, THE WHOLE THING IS GOING TO GET F’*KED UP AGAIN and all these dilweeb “journalists” who aren’t even giving a lily-livered argument for registered exchanges now are going to try to lay claim to the fact they told everyone. When in fact they are all acting like wussies on the issue now. It cost $38 million and took an entire year to do an incomplete examination of Lehman with actual verification of one $50 billion repo, a punt on valuation and an incomplete systems analysis. So, let’s say a true old style full systems transactional verification examine costs about $100 million and takes two years. That means examining the big ten takes the entire SEC budget, it’s entire staff and by the time the exams are finished they’re totally irrelevant. So, yes everyone is doing it, especially the big firms as they are inspection proof. The interesting quote in the Abelson article is from one of the unnamed former execs who said that everyone in the market knew what Lehman was doing with the Repo 105 gimmick. If everyone knows and adjusts their perceptions of Lehman accordingly, then the execs are probably right about the gimmick being not a big issue. However, I suspect that while many people knew not everyone knew and that will be a big problem for these execs. Even if the Repo 105 issue is de minimis, the flawed valuation methodology is not. The Lehman execs can whine all they want to, but their company was a mess and deserved what happened. Corporate accounting and reporting unfortunately permits a lot of skating on the edge. And sometimes management goes over the edge. Given the near meltdown of the global financial system, it would be surprising if more firms didn’t skate over the edge. I am very happy to have found this thoughtful and provocative forum. Most of those posting here seem to be reasonable people, and by that, I mean they seem to feel that capitalism is in general a good thing, that actual market forces, when harnessed in ways that encourage the generation of real wealth, are also good. Those that have drunk the kool-aid of how full deregulation is the paragon of market virtue (AJ seems to fall in this camp, he reminds me of a fellow named Charles Ellis I heard one time doing his best to make all the sheeple accept 100 cents on the dollar AIG bailouts, etc.) clearly feel that whatever capital can be wrung from any market is money that has been earned fair and square — their ultimate defense is that what is done is always run past the legal department (with far more brilliant and nuanced thinkers than ordinary mortals can even fathom) so that is must be legal therefore beyond reproach, never mind reprimand. I have undertaken to educate myself, starting with John Locke, Thomas Aquinas, Adam Smith (I knew most of that already) and on up to John Maynard Keynes, Simon Johnson, and Michael Hudson. The perversion of language (what is freedom in the markets?) is probably the key point to be pondered, in all its Orwellian convolutions. Is freedom just supply and demand with caveat emptor and no regulators? Or is it freedom from feudalism and the ever-more-elusive aspiration of upward mobility based on good pay rewarding hard work? How do you feel about living off compound interest? Could you do it without feeling guilty? ratings agencies, Moody’s and S&P: incompetent. You may wish for govt to take over. banks should fund commerce. that’s all. banks and investment “thingies” should be different. the tax code will only lead to more creative rule-breaking. Every major banking group and investment bank knew the others were doing exactly as they were doing with enough certainty that they stopped dealing with each other. That means roll overs of repos virtually ended for a time and major hedge fund customers and big companies pulled their balances. Then, the race was on to get others deposits faster than they they lost their own. This was confirmed in capital letters the day the Treasury threw the Exchange Stabilization Fund into the hopper. The accountants and finance types pride themselves on being aware of what their peers are doing. They yap and yap and yap and even worse email themselves into the slammer. Never ending. If you have long time dealings with people you get to the point where they are quite predictable and you are predictable to them. The emphasis is you are predictable to them. Toss this into the social mish mash and smart guys can put situations together. We do not do golf to death for nothing. Soooo, everyone ran for cover at the same time the moment Lehman was decided by the Federales. The really smart guys got out before hand from knowing Paulson in particular. You gotta decide and act. Finance is like foreign relations. You never know with absolute certainty ever until it is too late to use the decision . So you must move with imprecise information. Everyone cooks the books and mostly deceive themselves. The best accountants and finance types know this and use it to their advantage. The caveat on the wall is know yourself and never cater to your weaknesses except after hours.And that very carefully. My own version of this is to remind myself of Sherman at Shiloh. Financial statements are always an internal compromise opinion on the state of the company before you do what is necessary to survive. Lehman was killed by the yapping factor in the months before they went down. Much of it was deception for shorting purposes. Lehman was the natural in the pecking order after Bear went down. What drove John Paulson near nuts while doing his caper was not knowing enough about who was holding the other side of his deals. Who was dumb enough from his side of the deal. Once he realized imperfectly that far too much was being retained by the firms he dealt with he knew he had a winner. He did not have quite enough insight until one day he had a visitor that provided the added marginal information he needed. The only reason there is a report outlining the egregious behaviors of Lehman is because they were the only bank that was not privy to the bailout, and thus, it failed. And thus, there is a report analyzing the behaviors that led to its bankruptcy. 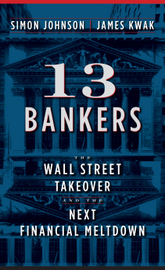 There were plenty of other banks that were bankrupt, but, thanks to Paulson’s TARP, did not end up in bankruptcy court. I’d LOVE to see this kind of scrutiny of the books over at other banks. We know, however, thanks to this report, that the scrutiny provided by the Feds is not scrutiny at all, but, rather, a rubber stamp. Perhaps, as Paulson asserts in his book, Lehman was truly the only bad apple in the barrel. But other struggling banks were granted the lifeline that was refused to Lehman. And that’s why we are even having this conversation at all. Because Paulson let one bank fail. Posting again lest you miss it. Look, I typically don’t follow comments after I comment, so don’t be surprised that I didn’t write anything. I was a bond manager for 6 years. I bought billions of dollars worth of deals that were issued under 144a. I was a risk manager for several life insurance companies for 6 years. I talked with the bond managers about rule 144a securities. They didn’t view it as a risk factor, and neither did I when I became a bond manager. So much debt is issued under rule 144a, it is incomprehensible to me that we would do without it. When you are managing a lot of money, the announcement of a bond deal comes, and it can close in as little as 7 minutes or as much as a few days. There is no time for a prospectus up-front. Disclosure is standardized, so you look at the terms, and decide whether you want to put in for the bonds or not, after consulting with your credit analyst. Simon has never been a bond manager; I doubt you have managed bonds as well. You should be more careful about what you say, you have not done your homework. I am doing some research to see what percentage of bond deals in the US get issued under 144a — I think it is around 10%. That’s not trivial; it makes life easy for bond managers. If 144a was a ripoff for the buyside it would not exist. QIBs manage most of the assets of this country, and 144a is not a concern. Maybe some pointy-headed academics that don’t know the market, but not QIBs. Most complex financial institutions routinely engage in extensive window dressing operations to manage earnings and conceal the real levels of risk and leverage on their balance sheets. If one were to conduct a spot audit one month after a reporting date, they would find a radically different and most likely far less flattering picture. There are a few common devices employed to manage/manipulate financial statements. One of the most popular was pioneered by Enron and has now been adopted by virtually every major financial house and even the the US Gov, treasury and FRB. That is the second balance sheet aka the off-balance sheet balance sheet. i.e. if you pretend it does not exist then it does not exist. Another popular method is the Level III bucket. If management is unhappy with any valuation, they just dump it in Level III and assign the desired and “correct” value. Another less discussed method is quarter and year end transactions whose sole purpose is to create a more favorable picture for official reporting purposes. The GenRe(Buffett)-AIG(Greenberg) case of using sham reinsurance agreements to manipulate AIG’s numbers. This case was only unique because they got caught. This had been a very common practice amongst the fraternity of major cross-border insurers. About 10 years ago a major european reinsurer marketed a product to insurers called “EPS”. I’ll let you guess the purpose. But the name was later changed although the scheme was continued under another less obvious name. Major global capital markets players also regularly engage various swaps and repos for the sole purpose of manipulation of their books. These schemes are so common and complex, that only a handful of top insiders has any real idea of the true financial status and condition. How do you regulate that? BTW the same methods have been used to aggressively avoid and minimize taxes. If my understanding is correct, then “gaming the system” is probably the most rational and self-interested behavior imaginable under the circumstances. Of course, I always thought Obejctivism read like a psychopath’s charter. Nolle Prosequi / Nolo Contendere. No win & no contest when we become the judge and jury of our own actions. Remember the days of Enron? Turned out everyone and their mother had cooked the books? If there is a loophole, you will find a superhighway full of companies driving through it. Anything that is legal is fair game, even if it violates the spirit of the law. And game is the word, because all the free-marketers I know of think that’s all’s fair in love and business and as long as you don’t break the letter of the law, you should be commended for your ingenuity. It’s just a game to them, even if for the losers, it’s often their lives. Social Darwinism at it’s best. “In my opinion, it’s very unlikely that the regulators and supervisors would evoke a strict prohibition until a crisis came and then it’s too late,” Volcker said. “That’s why you want it in legislation. “The government also was handing out millions of dollars to bank regulators, rewarding “superior” work even as an avalanche of risky mortgages helped create the meltdown. The payments, detailed in payroll data released to The Associated Press under the Freedom of Information Act, are the latest evidence of the government’s false sense of security during the go-go days of the financial boom. Just as bank executives got bonuses despite taking on dangerous amounts of risk, regulators got taxpayer-funded bonuses despite missing or ignoring signs that the system was on the verge of a meltdown. This post opens a fruitful line of inquiry. It is my understanding that intra-quarter many of the banks took their leverage ratios significantly above 100% and brought them down to mere nose bleed territory 30-40% at quarter’s end as a form of window dressing. “Mr. Greenspan, who led the U.S. central bank from 1987 to 2006, has been criticized by some analysts who argue he kept short-term, benchmark interest rates too low for too long in the early 2000s. The former Fed chief defended the central bank’s actions, saying that the seeds of the housing boom were sown by geopolitical events that were out of the Fed’s control, an argument he has presented a number of times in the past. The fall of the Soviet Union led to hundreds of millions of workers entering the global marketplace, he said in a paper to be presented to a Brookings Institution conference. “I guess I should warn you, if I turn out to be particularly clear, you’ve probably misunderstood what I’ve said”. I must be one of the few people who has read the examiner’s report from cover to cover. Jail time is the least of the problems the Lehman and E&Y people are going to have. We’re talking about money here and people were deceived. Frankly, I’m surprised that Abelson’s anonymous source hasn’t been found floating face down in the East River by now. You know, this attempt at claiming to be “expert” is usually the first sign of a very weak argument. And “I would be careful” is cliche/code which stands for “don’t ask questions, don’t challenge the status quo”. You know it’s a funny thing, when banks write the prospectus for credit cards, which can be done with the signature of a pen, it never seems to bother the banks that pay your paycheck then, does it??? And what defines a “QIB” Mr. Merkel??? In fact who is a “QIB” and who is not is not easily defined. In fact with many of these “private placements” can you tell me what standards a QIB must meet??? Any at all??? Also, if the prospectus language is “boilerplate” as you say (Which I doubt in fact that it is) you shouldn’t have any problems writing it up and getting someone to sign it should you??? After all, if it is “boilerplate”, there would be no worries would there??? In fact and in reality it is not “boilerplate” and not all deals are the same. And if you and other dealer traders were required to do that and be liable and criminally responsible for your promises/actions, I have no doubt you dealers and traders would do just fine. After all, since traders and dealers are such fine, honest, and outstanding citizens, there would be no worries with having a prospectus would there be Mr. Merkel??? Can you give me ONE example of any trade or deal in the history of the world which was not accomplished BECAUSE OF A PROSPECTUS??? We’re eagerly awaiting the example. Let me also add Mr. Merkel, If a cocaine dealer says “I deal in cocaine, the police don’t deal in cocaine, so they don’t know enough to regulate my business.” is a preposterous argument. You don’t need to deal/trade in something to see it is damaging society and stop it. I reconsidered the stance on violence that my mother taught me the first time I beat the crap out of a bully when I was a kid. He stopped making trouble for me after that, and there were no negative consequences what so ever. A global savings glut??? Just who was supposedly saving? I think you may inadvertently have hit the nail on the head. I contend that credit analysis is at the heart of the problem, whether in banks or the credit rating agencies or the regulators. It was the the credit people, whether they were neutered or neutered themselves, who might have saved the day. “Disclosure is standardized”. OK, everything must be fine, then, if disclosure is standardized. There is much more to true credit analysis than standardization of disclosure; indeed real credit analysis must, of necessity, look beyond the standard. That’s not your problem; you’re a trader. You and yours could not have prevented what we’re going through. It was partially (and I’m tempted to write significantly) a failure of the contemporary credit culture to adhere to reasonable standards (there’s that word again) whether at the middle or senior management levels that led us to the present circumstances. When has any investment bank known the least thing about credit? That’s why they contracted it out to others. What’s worse, I contend that there are few in senior positions now that understand how real credit is done, and this will hamper bank lending for years to come. Actually no – I’m just being stupid! If Abelson is right, that everyone does it, I truly regret retiring from SEC enforcement 3 years ago. What fun I could be having now! And don’t let Abelson and the others fool you. This is fraud if it is not disclosed to shareholders and the market, whether or not it is GAAP (General Accounting Arguments for Purchase). Leaving aside Greenspan’s justifications, you really don’t know who experienced a savings glut? Think China, Singapore, Korea, etc. Ted, we don’t know each other. You have no reason to trust me. I’m not going to prolong this, but I will simply say that your comments are not representative of those that work in bond management. You don’t know what you don’t know. Do you have any sympathy toward those who have experience that you do not have, and disagree with you. I do not purport to be an expert — let those with knowledge challenge me. But you don’t have knowledge, it seems — only bias and invective, and you spout that freely. Say what you want, you don’t know what you are talking about. But, if you do have knowledge, bring out some positive facts — have you calculated the percentage of deals done under rule 144a? I have. Have you positive proof in individual cases of fraud? Please display it. You seem to be a loudmouth with few facts, who has never worked in the industry that you criticize. So, bring facts, ideas that many agree with. I wait for the dearth of facts that you will bring.